The Site-Guard alarm system is a monitored wireless security system ideally suited to buildings and sites where hard-wired systems would be inappropriate, impractical or too costly to install. For internal or external use, the Site Guard Alarm can provide a much more cost-effective solution compared to traditional static guarding or mobile patrols. Our system has been designed to cope with the construction site environment and has a robust build quality, and proven reliability. The Site-Guard system does not require a connection to mains electricity like most alarm systems do so it can be deployed literally anywhere and the battery lasts for up to 5 years. In the event of an activation the system triggers a high output external siren with flashing strobe and a signal is sent over the GSM network to our alarm receiving center, where the operators will call your key holders or guarding company. Alternatively you can have the system contact your key holders directly via voice call or text message. On average our clients save 50-60 % when using our system with 24hr response when compared to a static guard. 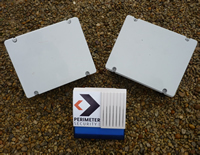 We use twin pir detectors, This means that each detector has two pir sensors inside a single unit. Both pir sensors must trigger to cause an alarm condition. Our system can also be configured to send confirmation signals to our alarm receiving center, you may then choose to only action the guarding company in the event of a confirmed alarm. If two detectors, each with two sensors inside have triggered at the same time ITS NOT A FALSE ALARM! We also have much more information on our new website here. © Perimeter Security Ltd | Registerd in England company number 6566502.